Innovative Networking and Security Solutions. A10 Thunder™ Series - A10 Thunder™ Series platforms are Application Delivery Controllers (ADCs) that provide Unified Application Service Gateway functionality by consolidating premium solution modules for intelligent Cloud services in the most efficient form factors. Built on A10's scalable and flexible Advanced Core Operating System (ACOS) architecture, the A10 Thunder Series platforms consolidate stand-alone solutions such as ADCs, Server Load Balancers, Carrier Grade NAT (CGNAT), IPv6 Migration, DNS Application Firewall, Web Application Firewall (WAF), SSL Intercept, Distributed Denial of Service (DDoS) protection, Application Access Management (AAM), and more, without license fees. AX Series -The AX Series is a new generation server load balancer with the industry's best price/performance, helping enterprises and ISPs to scale and maximize application availability through the world's most advanced application delivery platform. The AX Series load balancing family is revolutionary by current market standards due to its Advanced Core Operating System (ACOS) with a native multi-core CPU, shared memory architecture, which is exponentially faster and more scalable than other systems on the market. With the AX Series, customers do not have to sacrifice server load balancing features for performance. Plus, all features are included in the standard list price. 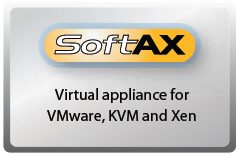 SoftAX, part of A10 Networks' award-winning AX Series Application Delivery Controller (ADC) family, is designed to meet the growing needs of organizations that require a flexible and easy-to-deploy application delivery and server load balancer solution running within a virtualized infrastructure. 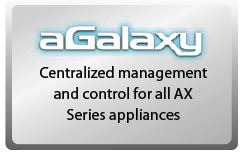 A10’s aGalaxy network management solution enables a network administrator to manage any AX device from a single point. aGalaxy is a robust network monitoring and network management solution that offers an intuitive interface that can be utilized to perform and automate a variety of essential tasks. EX Series - Bandwidth Management with Identity Reporting A10 Networks' EX Series is the industry's only bandwidth management appliance with identity-based application visibility. By managing bandwidth and traffic with unprecedented user and application visibility, the EX Series helps organizations of all sizes secure, optimize and scale their network edge and perimeter. By consolidating multiple WAN bandwidth management functions into one optimized management platform, organizations can greatly simplify their management of edge services, and increase performance and reliability for applications. ID Series - Network Identity Management The ID Series contains the industry's only network identity management appliances delivering integrated features that resolve IP addresses to user identity (IP-to-ID) instantly, simplify user password management with the User Self Help Web Portal, provision user account management, and enhance RADIUS authentication and access control. The ID Series IP-to-ID Service has earned the company numerous awards, enterprise deployments and technical partnerships. A10 Networks markets ID Series through resellers under the A10 Networks brand, and through agreements with technical partners such as Lancope, RSA (a division of EMC), WildPackets, RetiCorp and FireScope.